Please note that this is program is provided free of charge. No technical support for this program is available. In order to assist those planning on building their own Plantation Shutters, ShutterMedic provides a complimentary computer program that can assist you with your project..
All you have to do is enter the width and length of the shutter panels you desire to make. 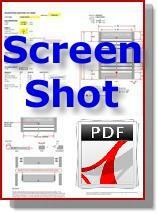 The program will generate a cut sheet in a printable format listing all the parts with their dimensions. User entry of area Dimensions. User entry of desired louver size (2 1/2, 3 1/2, or 4 1/2 inch). User entry of louvers desired in each panel. User entry of total panels desired in area dimensions. User can adjust width of stiles. Louver pin hole locations on stiles. Total linear feet of louvers, rails, stiles, tilt rods, for project. Total number of louver pins required. This is a great time saver for those who wish to build their own Plantation Shutters. I couldn't believe how accurate the system works and the help from Patrick at Shutter Medic when I needed questions answered about the program was prompt and very helpful. I highly recommend the Plantation Shutter Cut Sheet Program. The program worked as planned and we were successfully able to complete our home project. We were forced to upgrade our Windows Excel but that was long overdue. I would definitely recommend this handy software.